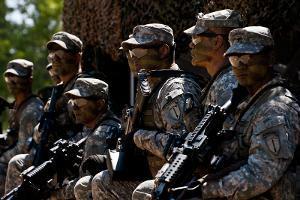 The United States Army Special Forces have five primary missions: unconventional warfare (the original and most important mission of Special Forces), foreign internal defense, special reconnaissance, direct action, and counter-terrorism. Other duties include combat search and rescue (CSAR), counter-narcotics, counter-proliferation, hostage rescue, humanitarian assistance, humanitarian demining, information operations, peacekeeping, psychological operations, security assistance, and manhunts.Special Forces have the ability to be virtually everywhere at once; this guarantees that they are the first on the ground or already at a crisis location when trouble starts. Army Special Forces skills and training offers a thorough knowledge of foreign languages, customs and cultures. In addition, Special Forces service members are masters at training and organizing insurgents, surrogate fighters, native forces and foreign armies. U.S. Special Forces — also known as the Green Beret — trace their roots back to the WWII Office of Strategic Services. The OSS was formed to gather intelligence and conduct operations behind enemy lines in support of resistance groups in Europe and Burma. In the Global War on Terrorism Special Forces teams have helped oust the Taliban government in Afghanistan, trained and fought along side the Kurds in northern Iraq, cleared the western desert of SCUD missiles, and provided long-range special reconnaissance to coalition ground forces on the drive to Baghdad.